Posted on September 29, 2011 at 4:55 am. Most companies have you sign an intellectual property agreement when you start, saying that anything you do under the auspices of the company that relates to the company’s business belongs to the company. Make sure that the publishing contract states explicitly that you, as the author, receive the author royalties and also make sure that you get something from the company that says that, notwithstanding your intellectual property agreement, you are the author of this book and that you are entitled to the royalties. If you don’t get this amendment, the company could legitimately come back to you and say that you owe them your royalties because of your standing agreement with them. Depending on the company you’re dealing with, they may ask you to write down the names of the books and magazine articles you might be working on. Be as prolific and vague as possible because you just don’t know what you might find yourself doing in a year and a half. It is easy to justify this by saying that you do all kinds of things for the STC, for writing students, and for other people. You also have a number of miscellaneous writing projects in the background that you work on occasionally, so it would be inappropriate to assign the rights to these, particularly if you’ve come up with these prior to coming to wherever it is that you are now. Only rarely have I ever had any kind of quibble; most people think it’s very cool that you’re an author and cut you a surprising amount of slack. (Hot tip: When discussing this, never use the word “moonlighting.”) The big thing about maintaining clear intellectual property rights is never to do anything outside the scope of your duties on company time or with company equipment: not only will that violate the agreement with the company, it’s just bad form. Posted on September 27, 2011 at 4:55 am. If you’re actually working for a company as an employee, there are several ways you can approach this. The first is to pitch this as an outside project, over and above your day job. I don’t recommend this! Unless you’re young and in good health and really like chronic sleep deprivation, this is a Bad Idea. Now, you might be able to do something if you a guarantee in writing that you’ll be working half-time while you’re doing the book. I did this once when a database company I worked at was going through a cost-cutting phase and tried to get everyone to take a salary reduction (basically because the guy who ran the company was a fool who thought he knew how to manage money). I went half-time for several months and wrote a book with the other half of the time. If you work for a company, I suggest that you pitch the idea of a book this way: you write the book. You get assigned the task of writing the book as your official job. You get your normal wages. You also take care of coordinating things with the publisher and doing all the legwork to set up the deal, and you get the royalties as described in the previous series of posts. Q. Why should we pay you a salary AND royalties? Q. Why shouldn’t we get someone cheaper? A. You can always get someone cheaper, but the value of having me do it is that I already am heavily familiar with the product I’m writing about and I know where to go for all the internal information. Any other author you get, even if they’re local, will not have the product history I do nor the knowledge of the people in the company. Expertise is not something you can pick up overnight. Also remember that I have product knowledge, I know how to put the publishing deal together, and I have the internal company contacts. Each of these skills can be found elsewhere, but it’s very difficult to find all three of them in one person. And if you do find them, it’ll be clear to them that you need them very badly, so their price will probably go way up. The bottom line to all this is the bottom line: you’ll get the book you want faster and better with me than with anyone else. What I’m describing is going to require a fair amount of negotiating skill on your part, but it’s worth it. And FWIW, this is no worse than the negotiating you need to do with publishers if you don’t have an agent. Don’t doubt me when I say that you’re going to earn all the money. It’s an awful lot of work you’re setting up for yourself. It’s possible that you’re going to deal with management that’s too cheap to want to pay you anything other than your salary. At that point, look at the deal and ask yourself how much writing a book is worth to you professionally. Be prepared to walk away from the table and say “No, this is way too much work and I’m not going to do this for just my salary. Thanks all the same.” (I’ve done this on book deals: if the money’s not good enough, I’ve told them that I don’t work for that little.) In particular, get a signed deal that you won’t be working more than 40 hours a week: books can easily become The Job That Ate My Brain. Posted on September 26, 2011 at 4:55 am. I’m not sure about where you work, but almost everywhere I’ve worked, such a book would either violate my non-disclosure agreement, or any profits I earn on such a book would belong to my company under the terms of my employment contract. Great question! Let’s talk about this. In fact, I’ve written so much that I’ve got several blog posts to add by way of answering this question. When you write a book for publication about anybody’s product whether you work for the company or not, you’ll be privy to internal information that will be covered by a non-disclosure agreement. If you’re writing about a new release of a product, it’s almost certain you’ll need to sign an NDA because what you find out before the product is released will be valuable information to the company. But the important part is that none of this will be going into the book. Are there similar products in the company being developed that may affect this book? Can you do a similar book for a “lite” version that may be about to be released? Is the company about to buy another company that would have products that are supporting/competing with this one? Is the product you’re suggesting to write about going to be discontinued soon? As you can see, this information is vital for planning the book and writing it, but it’s not something that ever needs to go explicitly into the finished book. Posted on September 23, 2011 at 4:45 am. I had a few more thoughts on readability to share. Making sure your text has a low Gunning Fog Index is not the only thing you can do to improve your readability. There are broader things that will help as well. The first of these is good structure. The old saw about telling someone what you’re going to tell ‘em, telling ‘em, then telling ‘em what you told ‘em, is still true for good technical communication of any kind. Give your readers enough information to whet their interest and to give them a mental framework to understand what’s coming soon. Then give them the explanation that they’re there for, and close with a summary of what they learned. Hand in glove with parallel writing is an established and understandable format. Make the format support the writing. Don’t use too many fonts, make the hierarchy in the heading levels self-explanatory, and have plenty of white space. Just to let your readers know what to expect, have information up front in the introduction in a “How to Use This Book” section that lists all your formatting conventions. Show what bold, italic, underlining, different fonts, and so on mean. Give examples of notes, tips, cautions, and warnings. Illustrations and graphics are very good. They add a measure of interest to the text and give the visual learners something to latch on to. The “Dummies” books are very good examples of using margin art to support the text. Even a set of standard graphics to highlight heading levels, notes, and definitions will give your readers a level of visual excitement that can turn a good book into a dazzling book. And, as Richard Hamilton pointed out on yesterday’s post, just because you use a small word, it doesn’t mean that it’s the best or most understandable word. I was in a meeting Thursday where the leader used the word “onus.” It’s a wonderful word and it was perfect for the venue (another good, short word, come to think of it), but it’s a high concept word that may actually decrease readability. “Responsibility” would’ve had generated a higher grade level on a purely mechanical readability score, but it would’ve been a better word for most audiences to give them better comprehension. Those are all the thoughts that I had this morning before caffeine had seeped into my brain. What do you think adds to readability? Posted on September 22, 2011 at 4:45 am. Avoid using “that.” Most uses of “that” are actually unnecessary. Ditto “all.” There are some cases where it makes sense, but the typical usage is something like “Sort all the parts in the bin.” In this case, “all” is really not adding anything. All this (or just “This,” as some would have it) brings me to a discussion of readability. Readability is simply a measure of how easy it is for your readers to understand you. There are a number of metrics for measuring basic readability, all of which look at the sentence length, word complexity, and punctuation marks, and then do something arcanely mathematical with these data points. There are a lot of different readability indexes, including Flesch Reading Ease, Flesch-Kincaid, Gunning Fog Index, and several dozen others. The first two of these are available in Microsoft Word in the proofing options. The Gunning Fog Index is available here. You just plug a chunk of text in and hit “Calculate.” Most tests measure in grade level—what grade would you expect someone to be able to read this?—but some measure in 1 to 100. I prefer grade level, as it’s easier to envision this how the writing will be received by my audience. I’m not going to tell you what formulas these use, as it’s not important. You’ll find online testing options for most of these on the net, so when you have a method you prefer, you can plug sample text in and see how it reads. It doesn’t matter which you use as long as you’re consistent. With all of them, the lower the score, the easier the text is to understand. What is so totally cool about this piece is that the Gunning Fog reading level on this comes out to about 5.5. That’s incredibly low for technical writing of any kind, but Brian did a great job. You still get a clear picture of how relativity works. Anybody can write drivel. Many people do. It takes a qualified writer to produce something intelligible. Unfortunately, there’s a pervasive belief in these folks that they won’t be perceived as qualified or smart if they don’t write such dense crap. This may even be true, but it should be noted that you may just be dealing with a whole lotta phony assholes hiding behind their degrees, too. You don’t have to bring everything down to “1984”-style Newspeak, where things are doubleplus good and you have to drink victory gin while writing. But when you’re selecting choosing words, you will communicate make your point better with your audience readers if you use words that aren’t as esoteric strange and are more comprehensible easier to understand and more concise shorter. Posted on September 21, 2011 at 4:45 am. As I wrestled a bit to get back in the saddle of writing this blog after moving, I thought “I need some more ideas for blog topics,” and this idea almost immediately popped up as an obvious topic. So let me talk about fiction writers a bit and then I’ll get to nonfiction writers. Trust me, it’ll be a pleasant journey. Fiction writers get asked “Where do you get your ideas?” all the time. Many of them have written about this, somewhat in self-defense. My favorite classic answer is that of Harlan Ellison, who, when asked this question for the thousandth time, replied “Schenectady.” This rapidly evolved to a whole shtick about a post office box in Schenectady that was home to a circular of ideas that you could subscribe to and use. Locus Magazine, the zine for SF & fantasy writers, used to run this one into the ground on a regular basis for decades. It was fun. Sidenote: At Worldcon last month, Dean Wesley Smith was on a panel and said “I get paid to sit in a room and make stuff up.” Chris York, who was on the same panel, replied “I write mysteries. I get paid to kill people.” We get to make stuff up and get paid for it. But all of this is about fiction writing, where people have a certain amount of free range in the things they can come up with for ideas. Where do NONFICTION writers get their ideas? Well, for me, it’s just like Neil Gaiman says: I make them up. Out of my head. There are a few differences in the process. For one thing, I’m generally not allowed to write about intelligent saurians unless there’s some way I can tie this into something real. (That pesky nonfiction dictum gets in the way again!) But I also get to write things that fiction writers don’t get to write, such as a coffee-table book of the history of men’s ties. Or the development of indoor plumbing (which is a fascinating story.) Or a million possible things on cooking (whether using saurians as an ingredient or not). All of these things are possible book ideas, worthy of consideration for at least a moment. Some of this can be mundane: “There’s a new version of Word out; I’ll write a book on it.” But fiction can be a bit mundane in that regard, too, with follow-on volumes to a preceding book or series. Much of the heavy lifting is done with character and world development and you can rely as much as you like on elements you’ve already established. The what-ifs and if-onlys can be simple: What if there was a book on using Firefox? What if I could just give my youngest a book of lifeskills when she went off to college? What if there was a basic guide on socializing birds so they make the best pets? If only I knew how to set up sound systems and connect them to my computer, I could get music and digital video throughout my house. If only I could figure out how to decorate the house on my own, I could save a ton of time and money and be sure that I’d get something I really liked. If only I could brew my own beer, I’d have good beer in the house whenever I wanted. But the point is that, just as with fiction, ideas for nonfiction books are cheap. Ideas are lying on the street like stray pennies. You can find them everywhere about literally anything. (If only I could get a job as an international courier, I could see the world for nothing.) There’s no telling what might trigger you to think of something, or when. (How can I reduce the number of drugs I take for my diabetes?) It’s the implementation of the idea that makes most of the difference. There might not be a market for a particular book, but that’s a second process. A new book on understanding the internals of the Commodore 64 is not going to ever see the light of day but a book on how to buy junked Commodore 64s and build a quick-and-dirty network to run the entire operation of your family farm or business for a total cost of a dollar-three-ninety-eight might actually be interesting. Determining the value of an idea is different from coming up with it in the first place. And FWIW, as you get more practice with generating ideas, you can start to generate better ones just through experience. If you don’t think of yourself as generating a lot of book ideas, try this: carry a notebook and write down every idea you find yourself thinking of that would make a nonfiction book. Don’t edit this for things you think would be good nonfiction books; just go for ideas. Chances are you won’t make it an hour or two before you realize just how many ideas you’re generating. Most of them won’t be worth more than the amount of time you gave them when you wrote them down, but you don’t need even one good idea a day to have all the ideas you could need to keep your plate full. Your ideas aren’t coming from a PO box in Schenectady. They’re always there in never-ending abundance, right in your head. Posted on September 20, 2011 at 7:40 am. I’ve always been a huge fan of serial commas, even before I knew what they were. It comes from growing up reading older books that all used serial commas religiously. There is a push by many to eliminate them as “unnecessary” and I disagree. It makes comprehension less clear for the reader. I’ve seen many examples of this, such as the classic apocryphal book dedication lacking a serial comma–“I’d like to thank my parents, Ayn Rand and God”–but this example adds a good visual element to drive the point home. Thanks to whatever uncited soul did this picture, btw; I found it on FB and I will gladly provide full credit and links to whomever did this in the first place. 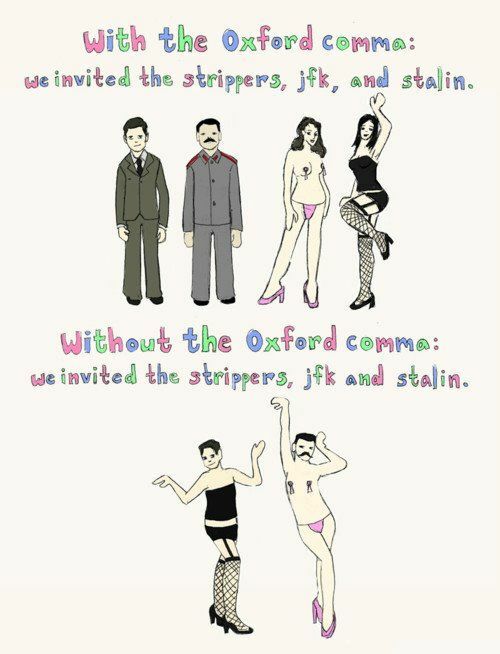 Serial commas are a good thing! Posted on July 29, 2011 at 4:55 am. Posted on July 27, 2011 at 4:55 am. If you want to do a run of a couple thousand books (or more), you may be able to talk to a small, specialty publisher. For example, Double Tall Press, XML Press, and Scriptorium specialize in smaller niche markets. There are dozens of other small publishers that may be able to provide you with boutique services but still keep your per-book costs down on smaller runs. The biggest disadvantages to most of these is that they don’t have big departments and budgets for distribution and marketing. However, if most of what you need is someone to help you produce a book and you can then market yourself, this may be a viable option.